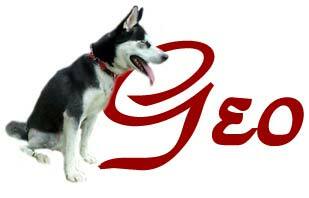 A Special Thanks to Ludwig's Corner Veterinary Hospital for giving Geo renewed hope! Geo, the lively young girl who was befriended by a good Samaritan who helped her recover from a car accident where she was left in the road to die. From her car accident, Geo suffered some trouble with her leg. She required surgery that cost over $300. The low price on the surgery was all thank to our wonderful vet's who worked with us to help this sweet girl. She found her forever home on November 17, 2001 with her new dad Quentin and her new Husky brother Vinny. And you would never know when watching her play that she had surgery. Thank you, Quentin, for giving her the love she so greatly deserves! Geo and Vinny are truly an evenly matched set. 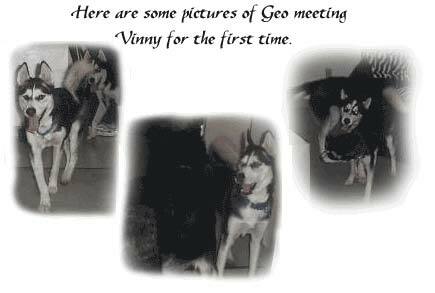 "First night - At bed time, Geo would not allow Vinny up on the bed. Second night - Vinny rushed past Geo and wouldn't let her up on the bed. Third night - Vinny and Geo both got on the bed. Geo managed to shove Vinny off the bed. Fourth night - Vinny shoved Geo off the bed. Fifth night - Vinny and Geo, in cahoots, both got on the bed and pushed me to the floor!" If you'd like to help Geo and other dogs who need extraordinary vet care, please click here to learn more about how you can contribute to the Toby Fund.